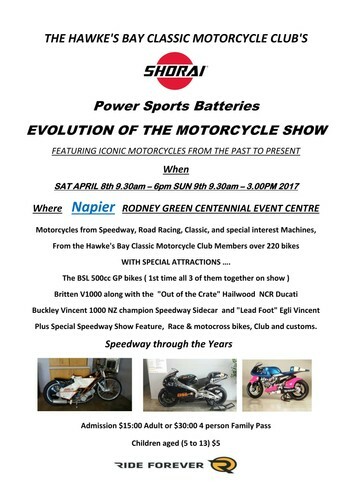 Motorcycles from Speedway, Road Racing, Classic and special interest Machines, from the Hawke's Bay Classic Motorcycle Club Members, over 220 bikes. With special attractions. The BSL 500cc GP bikes (1st time all 3 of them together on show), Britten V1000 along with the "Out of the Crate" Hailwood NCR Ducati, Buckley Vincent 1000 NZ champion Speedway Sidecar and "Lead Foot" Egli Vincent. Plus special speedway show feature, race and motocross bikes, club and customs.